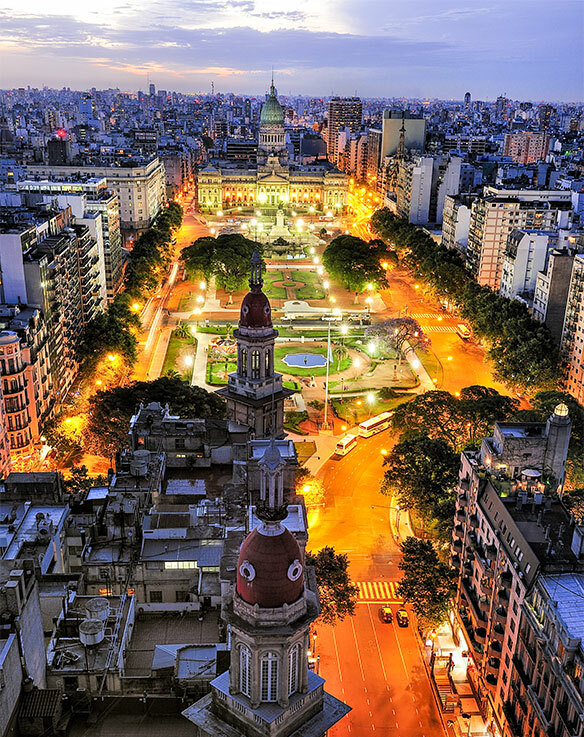 History and style cross paths in Buenos Aires, whose roots reach back to its founding in 1536. It draws comparisons to European establishments with its old-world sophistication, while the streetscape retains the more jumbled characteristics of some European cities – it was sometimes known as the Paris of South America. 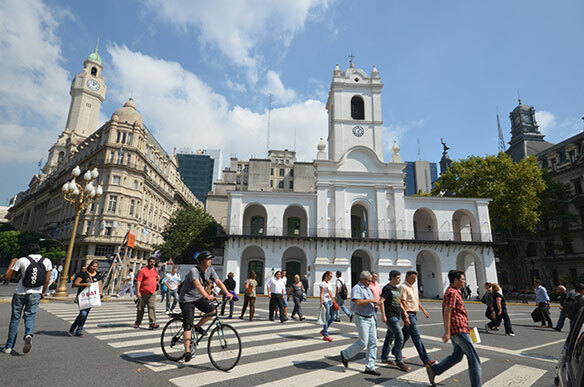 Contributing to this impression is the city’s stylish architecture – especially in the Recoleta section of the city – and the latest fashions that are on parade as part of day-to-day life. B.A.’s cosmopolitan atmosphere is reinforced by the many intimate sidewalk cafés that dot the city, signaling a connection to earlier waves of old-world immigration. Today, Buenos Aires has over 70 listed historic cafés known as “bares notables,” recognized for their importance to the city’s culture. These were the meeting places for illustrious literary, musical and political figures such as Jorge Luis Borges and Carlos Gardel. Their interiors are carefully preserved, and the oldest date back to the end of the 1800s. The cafés are usually open every day for breakfast, lunch snacks and the traditional merienda late afternoon snack. Good examples of cafés include Café Tortoni, El Faro and Confiteria las Violetas, which serve a typical cortado (espresso with a dash of hot milk) and medialuna (croissant). Some cafés even have daily tango shows. The tango is, of course, the famous dance created in Argentina in the late 1800s, and can be seen performed in many places around Buenos Aires. One of its original locations of growth was in the barrio (district) of La Boca, which housed the city’s immigrant poor and is located near the city’s shipping port. The tango arose from those hardships and captures the sentiments of nostalgia and sadness experienced by the working class arrivals from Europe, many from Genoa, Italy. The colourful Caminito promenade of La Boca has since been developed with tourism in mind – grab a table, order some “yerbe matte” tea and watch the tango dancers perform. Fans of football (soccer) may already know that the renowned club Boca Juniors is based here. If they time their visit well, they can join the rabid fans that will fill La Bombonera stadium for a game. de Mayo, in the small city park in front of the Casa Rosada presidential palace. This marks the place where the mothers of “disappeared” citizens marched in defiance of the military dictatorship ruling Argentina between 1976 and 1983. The white symbol of those marchers – a mother’s head in a scarf in profile – is a motif painted on the paving stones in the Plaza de Mayo. More of this rebel spirit is in evidence at the Avienda Liberador in Palermo, just outside of the Bosque de Palermo, which is a network of popular parks. It is the location of the Monument of the Carta Magna – also known as the Monument from the Spanish – and it commemorates the one- century anniversary of the May Revolution in 1810, which led to the Argentine war of independence and emancipation from colonial rule by Spain in 1818. The “monumento de los españoles” also indicates the four regions of Argentina, specifically the Andes, the River Plate, the Pampas and the Chaco. These are essentially the west, the south, east and north sides of the country, respectively. The province of Mendoza is located in the Andes region of Argentina, where the heat of summer is tempered by altitude and proximity to the mountain range. Vineyards in Mendoza are now basking in the intense summer sun and cool night air, with the grape harvest season of autumn (March and April) coming soon. For visitors, that means days of prowling through vineyards to assess the ripeness of the fruit, and nights of celebratory dining with glass in hand. Wine lovers around the world are well aware that Argentina’s reputation for fine wine has been burnished by Mendoza province, and especially by the Valle de Uco, one the most fertile areas. The Valle de Uco adjoins the Andes, which rise abruptly from the gentle countryside. This fortunate geography serves vintners in the sunny, hot valley, who welcome the cool mountain breezes for adding flavour complexities to the harvest. This is the scenic location of The Vines Resort & Spa, a new resort (as of 2014) which meets a unique visitor demand. 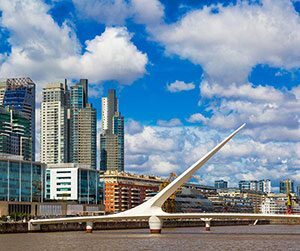 That is, while the wines of Argentina have gained prominence on the world stage, the opportunities for wine tourism there have generally lagged behind. Those visitors are now being served by a resort of modern style and elegance. At The Vines, a total of 22 luxury villas are clustered near a sleek central building, housing a lounge and dining room by noted Argentine chef Francis Mallmann. This compact collective is surrounded by vineyards that stretch to the horizon. Mallmann’s celebrated take on traditional “asado” (open fire beef barbecue) feasts are served at the Sieta Fuegos restaurant, and paired with lots of wine. The short walk back to the villas in the cool night air is bracing. The villas are spacious and some even have a second bedroom with a separate outside entrance. They all have kitchenettes, lounge space and outdoor decks, many with views of the mountains. About 185 owners have private vineyards within The Vines Resort & Spa property boundaries, covering a total of 600 hectares. These are working enterprises, whose owners range from dedicated hobbyists to full-scale commercial operators. But non-investor visitors come for the unique opportunity to stay within the heart of a working vineyard, enjoy the sublime scenery and even participate in the production of wine, from crushed grape to bottle. A Wine Camp follows the journey of the grapes through the early stages of vintage conversion, giving guests the chance to stomp the dark fruit and get generally dirty in the process. Vineyard tours on horseback are also available, guided by an agronomist who schools guests in the methods of growing, nurturing and harvesting various grape varietals. Things get really exciting on a 4×4 Land Rover tour up steep roads and trails into the Andes. Usually in view is Aconcagua, the highest mountain in the western hemisphere, at 6,900 metres. 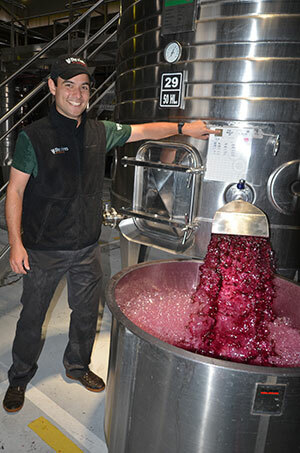 A grape solution in the early stage of wine making at The Vines of Mendoza. Back at The Vines, the opportunities for sampling wine have been steadily increasing with the construction of a winery village on the entry road to the resort. Twelve wineries are to be constructed in the Winemaker’s Village, and one of the newest – the SoloContigo Winery – is making waves with recent awards for its products. Specifically, the SoloContigo Colección Malbec 2014 received the top award (the Platinum Medal) at the recent 2017 Decanter Wine Awards, and was also named the Best Malbec in Argentina. Guests can sample this and other SoloContigo vintages at the winery. Its tasting room and patio face west, giving guests an uninterrupted view of the Andes, landscaped gardens and malbec vineyards, while they sample their favourites. With views to forever, it is a fitting finish to an Argentina journey. Alvear Art Hotel: A sleek five-star luxury boutique hotel in downtown B.A. Mio Buenos Aires: A compact top-rated boutique hotel in the Recoleta district of the city. Home Hotel: Inexpensive but stylish lodgings in the cool Palermo Hollywood district.